Tampa Bay Buccaneers second-year cornerback Vernon Hargreaves had a rough rookie season a year ago, allowing the most receptions and most yards as the league’s most-targeted cornerback in 2016. 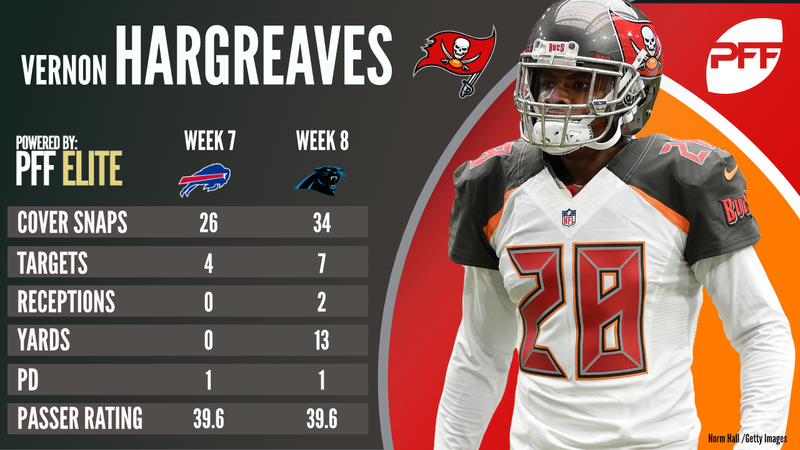 After a shaky start to 2017, Hargreaves has seemingly righted the ship with back-to-back strong outings against the Buffalo Bills in Week 7 and the Carolina Panthers in Week 8. Against Buffalo and with a healthy secondary for Tampa, Hargreaves shifted to a nickel cornerback role and played predominantly from the slot. He logged 36 snaps on defense, with only one snap lined up as an outside cornerback. He was targeted four times by Bills QB Tyrod Taylor and did not allow a single catch while also recording a pass breakup. In Week 8 against Cam Newton and the Panthers, Hargreaves shifted back outside due to injuries to both Robert McClain and Brent Grimes, and logged 63 total snaps, with 54 of them coming at left cornerback. Hargreaves was a heavy-target of Newton, seeing 7-of-30 pass attempts, a team-high. He however, only allowed two receptions for a mere 13 yards and recorded another pass breakup. Hargreaves was matched up against Kelvin Benjamin on two targets, allowing just one of those to be caught for nine yards and kept Devin Funchess off the stat sheet on four targets, holding him without a catch.